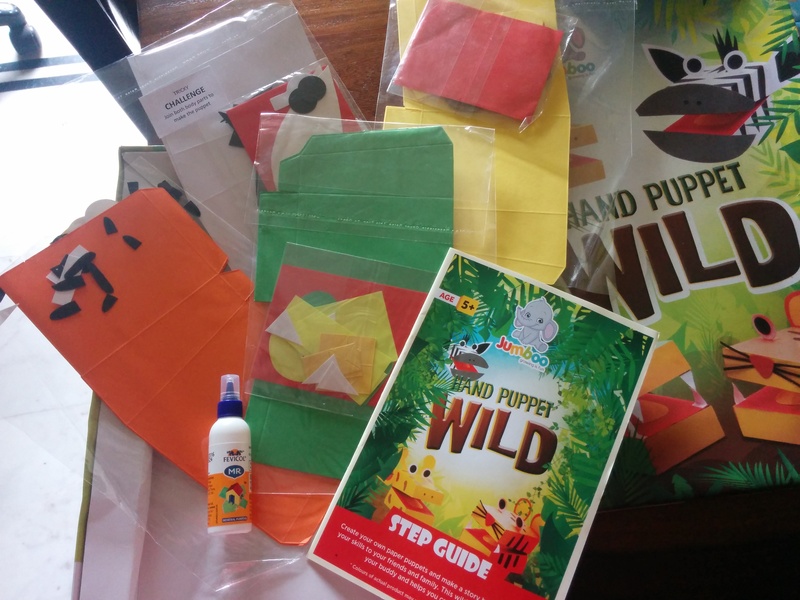 Recently, I chanced upon this fun and colourful craft kid from Hand Puppet Wild. It was from Jumboo brand, which was unknown to me till I saw it in the toy store. On further inquiry, the toy store owner assured me that it was quite a hit with young kids and he had sold it to many mothers who came back to him with positive reviews. Keeping my skepticism aside, I decided to give the brand a chance and bought it. The same afternoon, after my daughter came back from school and had her lunch, I showed her the activity kid. She saw the packaging box and was quite excited to see the animals on it. I told her it was a hand puppet making craft. She loves puppets and immediately opened the box. Out came 4 different packets containing material for 4 animals, glue and a step-by-step instruction guide. My earlier apprehensions about this brand quickly dissipated as I went through the contents. The kit contained all the material I needed to make 4 different hand puppets. All the materials were cut to precision, hence it was a scissor-free activity. The material for each puppet was neatly packed in individual plastic envelopes. The small parts, i.e. eyes, teeth, tongue, nose, ears, etc. were packed in smaller separate packets inside the main plastic envelopes. It contained Fevicol, hence I didn’t have to worry about the quality of the glue. It gave a step by step instruction guide which was easy to understand and follow. With the above materials and knowledge, our puppet making activity rolled out smoothly. Although the package box recommends it for 5 years and up, my recently turned 5 year old found folding the parts a tad difficult. However, an older child of 6 might be able to do it effortlessly. My daughter loved putting glue and sticking things. While I folded the parts, she glued ears, eyes, teeth and the smaller parts. Though initially we looked at the instruction manual, we soon got the hang of it, and didn’t even require it for the third and fourth puppet. Every afternoon for four consecutive days, my daughter and I made one hand puppet daily. We had a fun time making them and enacting a little act with them once the puppets were made. It was great fun! 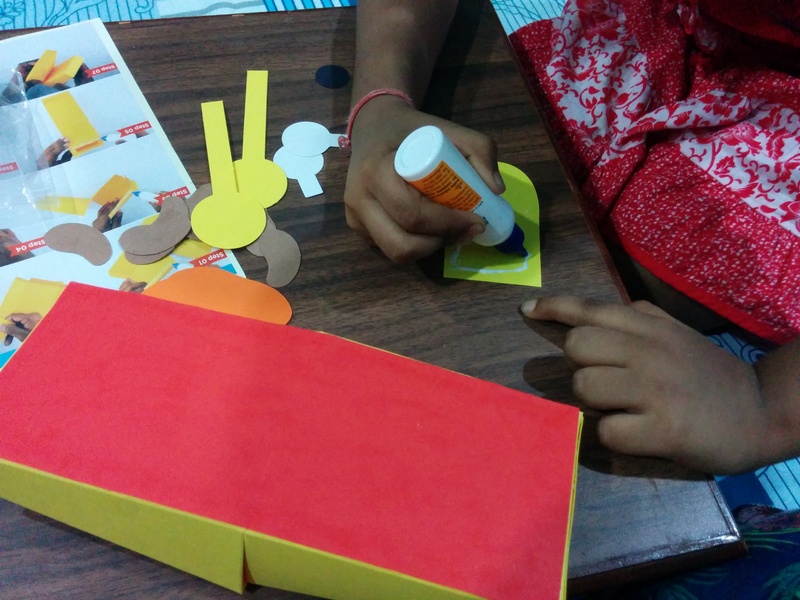 At the end of the day, I felt good (and not guilty) that I could spend some ‘crafty’ time with my child, and also that my daughter’s time was spent in a creative way rather than getting wasted watching the numerous shows on TV. I have very good intentions to go to the toy store and give my positive feedback on the toy, and see if I can get similar creative toys of Jumboo brand. Or else, will buy it online. I checked Jumboo brand’s website and found quite a few interesting toys there. They seem to be quite reasonably priced too! Hope you enjoy many creative, crafty afternoons with your child as I did with mine!